In order to give an complete list of ‘bacari’ we have subdivided them in the ‘sestiere’ (typical distric) where they are located. As for the name, ‘sestiere’ is one of the six parts in which Venice is divided.They are different from the ghettoes that were tipycal of Roman cities that normally subdivided the city into four parts, throught the ‘cardo and Decumano’ main streets. ‘Sestieri’ still have had their own names since the time of ‘Serenissima’, when they were administrative districs. It is the most pupulated among the ‘sestieri’ and it is the first you can meet along the way from the train station of St. Lucia .You can find many ‘bacari’ along the ‘ strada nova’ street or along the lateral canals.Also the area of ‘fondamenta dei Ormesini’ is very haunted, this is the soul of the nighlife of the city. It is the biggest ‘sestiere’ in Venice and also the farthest one. For this reason it is usually inhabited mainly by the local peole, and the turists may arrive here in occasion of ‘la biennale’ exhibition or during some important events held at ‘Arsenale’.You can find here a lot of ‘normal’ shops and not only souvenir shops all made in china, that you can find in the most turistic area of the city. 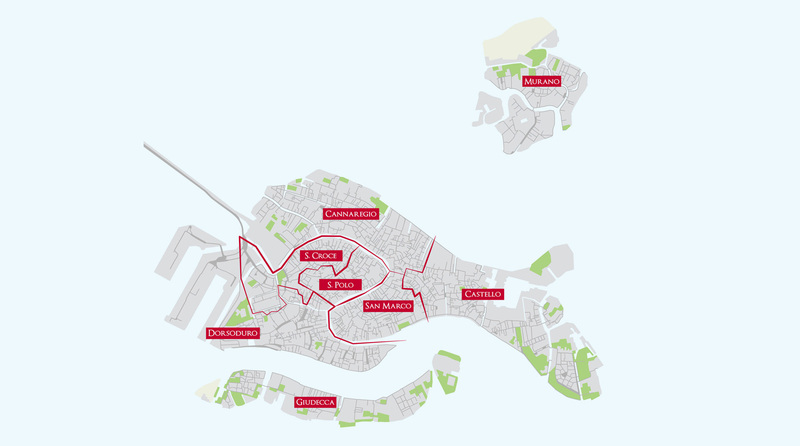 It is in front of the ‘island of Giudecca’ where is wonderful to have a walk along ‘ fondamenta delle Zattere’ to enjoy the sunset above the skyline of the city. Also ‘Campo S. Margherita’ belongs to this ‘sestiere’ that is a meeting point for students and young people who crowd the numerous taverns of this area. Currently it is the entrance point of the city for people that arrive by car as it includes also ‘piazzale roma’ and ‘ il tronchetto’. Here you can find some of the best ‘bacari’ of Venice. We are in the turistic heart of the city, the most visited and commercial area, for this reason you can’t find many ‘bacari’ nearby, the’ bacaro’ doesn’t love the overcrowded places. This ‘sestiere’ includes the Rialto Bridge area, place for trading and drinking and, for sure, you can find here a lot of ‘bacari’. Beside the ‘Sestieri’ of Venice we have also added the ‘island of Murano’, where you can find some authentic ‘bacari’that you should visit among the famous shops of glasses. It is famous worldwide for its artistic glasses creations since the time of ‘Serenissima’ when was declared that all the companies that produced glasses would be moved in this island in order to limit the numerous fires caused by the melting furnaces. Among the laboratories and glasses shops you can have a rest in some of the most authentic ‘bacari’ of the island. 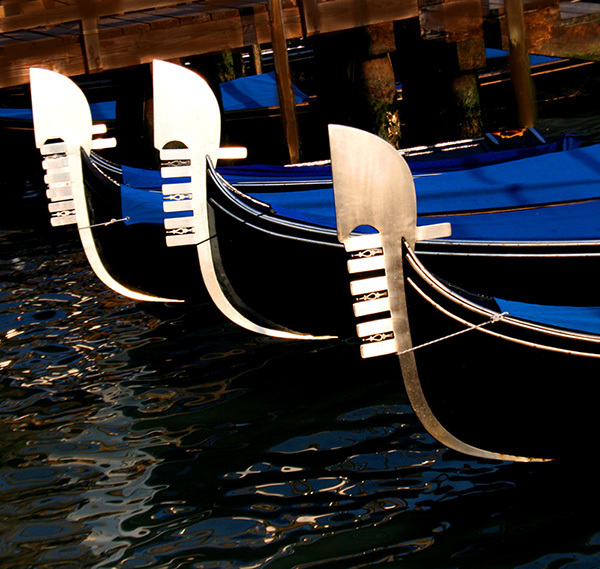 The iron placed at the bow of the ‘gondola’ boat represents the ‘sestieri’ in the six teeth in the front, otherwise the tooth in the back represents the ‘island of Giudecca’. This ‘S’ shape underlines the path of’ Canal Grande’ river, and the small arch over the last tooth reminds the Rialto Bridge, and the wide volute above represents the Doge’s horn and the water basin of S.Marco. A Stylized representation of the city. To be updated with the new Bàcari and tours subscribe to our newsletter!